A student conduct complaint or discipline hearing can derail your academic career, and your life. We can help keep you in class while fighting your criminal case in the courts. If you are facing a conduct hearing or academic fraud hearing on campus, your degree and your future are in jeopardy. Even in cases where a student is not suspended or expelled, an office warning from the student conduct board can follow you around impacting opportunities for graduate school and advanced degrees. Frequently, a student conduct investigation will occur at the same time as a criminal investigation. The University is held to a different standard than law enforcement–you will not be provided a lawyer, you will not be advised of your rights, and they don’t have to “prove it” beyond a reasonable doubt. Evidence that is obtained in the campus investigation can bleed over into your criminal case. And charges that start in the criminal system can sometimes wind up affecting your academic career–even if they occurred off campus or out of town. If you or a loved one are facing a student conduct or academic fraud investigation on campus you need to consult with an attorney. If you are charged with a crime, or under investigation for one, and you currently are enrolled in school, you need an attorney with experience in both systems. 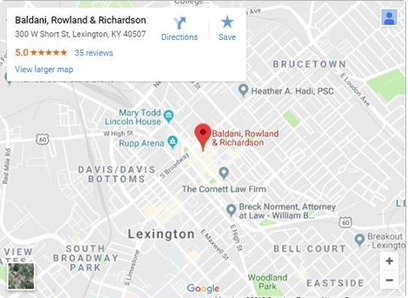 Our firm has represented students at the University of Kentucky, Transylvania University, the University of Louisville and other Kentucky colleges. We know that good kids make bad mistakes that shouldn’t cost them their careers. We have had on campus disciplinary hearings resolved with informal warnings to keep the charges off of student records. We have also kept criminal cases out of the campus system entirely, allowing students to go on with their academic career. Contact our Lexington criminal defense attorneys at Baldani Law Group to figure out what to do next. We can listen to the facts and help you decide what is best for you. Call us now at (859) 474-0001 or schedule a free phone appointment below. It happens every April and every October. Hundreds, if not thousands of college students from across the region go to Keeneland for the thrill of horse racing, and maybe to drink in the parking lot. Inevitably, some of these students are underage. Any given weekend several students will be ticketed or arrested for crimes ranging from public intoxication to possession of a fake ID. If this happens to you, you aren’t just looking at a case in the court system. Under the University of Kentucky Code of Student Conduct (UK AR 4-10) if you violate any state law or local ordinance you can face sanctions, regardless of where the violation occurs. “The Code applies to behavior that occurs on or off UK Premises” – UK Code of Student Conduct. Almost all other college codes of Student Conduct have a similar provision. Because of this, we take even very minor charges very seriously. If you are arrested at Keeneland, or anywhere off campus for underage drinking, give us a call before you go to court. If you were arrested while tailgating at Commonwealth Stadium/Kroger Field, you are on campus. And if you are a University of Kentucky student, this increases the chances that the case will be referred to the Student Conduct Office. If the case is referred to the Office of Student Conduct you can expect to be called in for an informal conversation with a Student Conduct officer. You will be asked questions about your pending criminal case that could be used against you in court and in a later proceeding. That is why it is best to talk to a lawyer well in advance of this meeting. The answers you give at this meeting will determine whether the case is referred to an Informal Resolution, a Formal Resolution, or dropped. An informal resolution or a dropped investigation will go a long way in helping you keep your academic record clear. You can face penalties anywhere from an informal warning (a warning that does not go on your permanent record) up to permanent expulsion. Every case is different and having someone with experience in the process can help improve your chances.